Up until recently, Chicago's top chefs wouldn't dare put tomatoes on their menus until August, when they could source them locally. ROCHELLE, Ill. (WLS) -- Up until recently, Chicago's top chefs wouldn't dare put tomatoes on their menus until August, when they could source them locally. But a new business west of the city is now growing tomatoes under glass, hydroponically. They're using Dutch technology to grow tomatoes indoors. He says since they're local, taste great when picked, and a lot of kitchens in town are now relying on them. It's a typical lunch rush at the Three Arts Club Café in the Gold Coast, and yet another plate of creamy burrata with grilled toast, basil and tomatoes is being assembled. "Just like berries and what not, tomatoes are something that diners want all year round," said Chef Bradford Phillips. But Phillips never used tomatoes much. At least not until late summer, because of the growing season. But now he's getting those tomatoes year round. "It doesn't matter what season it is, you're always trying to find the best available ingredients and the fact that they happen to be local just makes it that much better. "Local" in this case means 82 miles west of the restaurant, in Rochelle, Illinois, site of the MightyVine tomato company, where they grow 4.5 million pounds of tomatoes on 7.5 acres. "It's been amazing to have that land re-purposed into agriculture because originally it was just grown up to weeds and trees and we couldn't use that land at all," said Kaleb Kennay, whose family originally owned the land that MightyVine bought. He's now a partner. "In the Netherlands, they've been doing this for decades, partly because - necessity being the mother of invention - they've got a smaller country that punches well above its weight in terms of trade. They figured out ways to grow things on minimal amount of land," said MightyVine CEO Gary Lazarski. They grow two varieties: a cherry-on-the-vine type called Robinio, and a larger version called a Roterno (they're working on creating better names for marketing purposes). "We don't pick our varietal for maximizing yield, we pick one that's gonna be a great tasting tomato for the local market." As impressive as 7.5 acres looks, this is a massive facility. MightyVine is going to be doubling this by the end of the year, plus, adding a couple of new varieties on top of the two they currently carry. 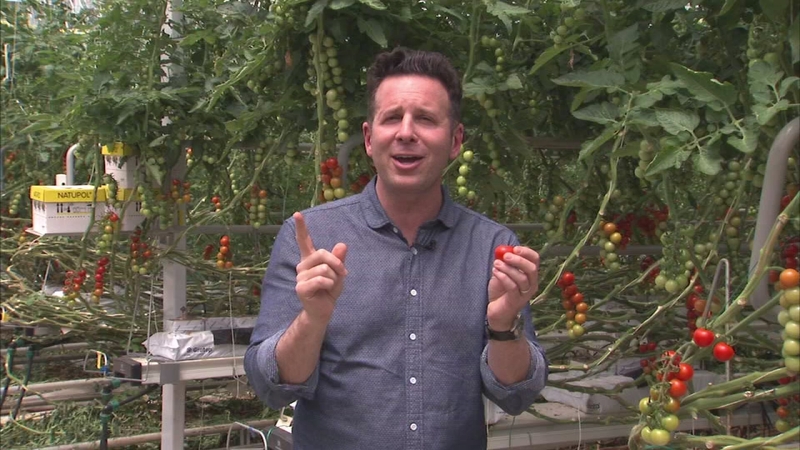 In this week's Extra Course, Steve talks a bit more about those two unique tomato varieties, from the greenhouse in Rochelle.